Our room design service helps you create an organized space, asthetic to the eye and functional for every day use! 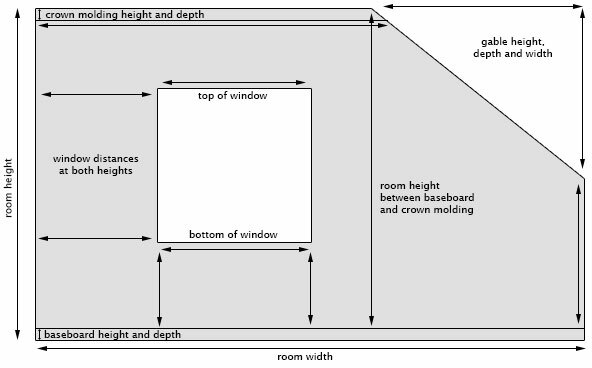 When measuring your room, please remember to measure the widths of walls and windows at both the base and the top, particularly in older houses. Walls may begin to slant over the decades and edges may no longer be straight. Distances to walls from window edges may not be the same across walls and rooms, even if they appear to be so. Please remember that windows and walls can slant towards or away from you. We can build your furniture to fit perfectly within the space, even with slanting walls, but we need to know the angles in order to design the perfect fit. Is your window perfectly square? Does your wall have a gable we need to take into account? Are there baseboards we need to go around? Is there crown molding we need to accomodate for? We keep over 80 sizes in stock, and we build just about anything we can draw. You may design bookcases or other furniture pieces to fit your room, your space; making your dream come true of a home library, nursery, study, office, bedroom or whatever the project. Whether we draw up a sketch for you, working with dimensions you provide us, or whether you arrive at our store with a drawing in hand, we will work with you towards realizing your concept until it's just right. The design may include many elements, including legs, feet, drawers, doors, or crown moulding, just to mention a few of the options available among our broad repertoire. Our photographs on this site are but a handful of the thousands of custom pieces we have built over the last fifteen years. Many, many more photos are available for viewing at our store. Should you not see a picture of what you want on this web site, chances are that we can build it. Please do ask.